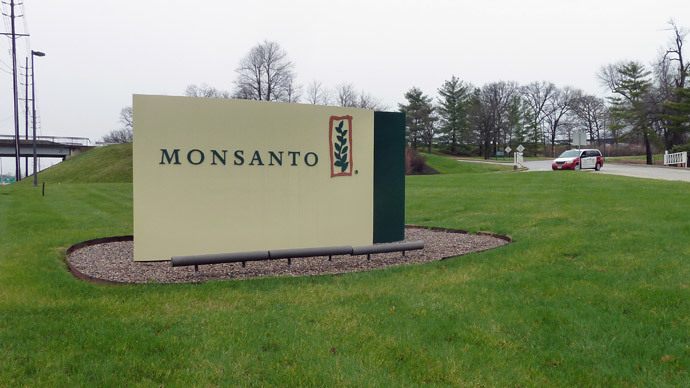 Monsanto has won final approval from the US for its new genetically-modified soybeans and cotton, designed to withstand a dominant biocide that fights weed resistance built up as a result of the company’s glyphosate-based Roundup herbicide already in use. The US Department of Agriculture’s Animal and Plant Health Inspection Service (APHIS) announced Thursday that the powerful biotechnology corporation’s GMO cotton and soybean plants have been given “non-regulated” status. Monsanto now awaits approval from the US Environmental Protection Agency for the new herbicide – a mix of the formidable chemical dicamba and glyphosate, which the company has developed for use on the newly-approved GMO crops. The new GMO crops – coupled with the dicamba/glyphosate cocktail – make up what Monsanto has dubbed the 'Roundup Ready Xtend crop system,' designed to trump super weeds that have evolved along with the company’s glyphosate-based Roundup biocide. Dicamba was first approved in 1967 and has been linked to high rates of cancer and birth defects in the families of food growers, according to government and other scientific studies. Consumer, health, environmental, and farmer advocates have fiercely opposed the new Xtend system, as it portends an overall “10-fold increase in dicamba use in American agriculture, from under 4 million lbs. at present to more than 40 million lbs. per year,” according to Center for Food Safety. “Monsanto’s genetically-engineered dicamba-resistant crops are yet another example of how pesticide firms are taking agriculture back to the dark days of heavy, indiscriminate use of hazardous pesticides, seriously endangering human health and the environment,” said Andrew Kimbrell, executive director of Center for Food Safety, in a statement. The USDA and Monsanto have said that Xtend will increase dicamba use in cotton by 14 times current levels, according to Reuters, and, in soybeans, 500 times current levels, the Pesticide Action Network said in a statement. "I am convinced that in all of my years serving the agriculture industry, the widespread use of dicamba herbicide [poses] the single most serious threat to the future of the specialty crop industry in the Midwest,” said Steve Smith, Director of Agriculture for Red Gold, a tomato-processing company. Opposition -- and even the USDA -- says more dicamba will only mean additional weed resistance in the future, translating to more profits for the likes of Monsanto and Dow Chemical, which received US approval for its genetically-engineered 2,4-D-resistant corn and soybeans in September 2014. "The pesticide treadmill spins on, and that's great news for Monsanto," said Gary Ruskin, executive director of U.S. Right to Know, a consumer advocacy group, Reuters reported. "This is just the latest in a endless string of favors from our federal government to Monsanto." Crops most at risk from increased dicamba exposure include fruits, nuts, and vegetables, growers of which say they fear the chemical will drift onto and damage their fields. Monsanto, according to Reuters, said it will educate food growers over the proper way to avoid dicamba drift. But biocide opponents are skeptical of these promises and say the burden will rest with the growers -- not Monsanto. Biocide drift will also adversely impact flowering plants and their pollinators and other species, which depend on them for nectar and habitat. Meanwhile, Monsanto is awaiting approval from China to allow imports of its new soybeans. China has been reticent about approving more GMO crops, as exemplified in farmer lawsuits aimed at American agribusiness companies following the nation’s rejection of US genetically-engineered-corn imports. Monsanto Chief Technology Officer Robb Fraley said last week that Chinese approval is expected in time for Xtend’s commercial launch in 2016.